GenF-GTS:- Hopefully HSV will pick up on this issue quickly if they haven't already and do a recall for this issue. Is GM doing this for the LSA's in the USA or is it up to the owner to perform this mod themselves? GM have not done a recall on them, I also do not think HSV will either. All the guys in the US change it themselves. We'll as bad as the 60,000mile shaft looks it hasn't failed. With that being near 100,000km I can't see them recalling them. The Callaway cb4 was never recalled was it? It may not have reached failure but it's still not good. Callaway wasn't recalled either......none will be. Ah don't get me wrong it's way premature wear. Just pointing out there's fat chance of HSV recalling. I'd defiantly change it myself if I had one. Before anyone makes this change they should listen to how the engine sounds. The reason why this part is in place is to reduce blower rattle a low rpm by keeping pressure on the blower rotters at low rpm. If you listen to an engine with the solid coupling in place it sounds like there is a lot of marbles rattling around in the blower. I did a stage two upgrade , the new coupling was installed in the car before mine at the same work Sams performance , it was his first one as well and the noise was really bad. When we put the original part in place it sounded perfect , just it had come out of the factory. This my theory with the wear on the shaft. When the item is installed from factory it does not have enough preloaded pressure put on when it is ***embled, this means the spring is moving on the shaft, thus wearing the shaft over time. My advice have listen before you decided to change this part you be shocked by the sound of your new car. Can the metal from the worn shaft get into the engine? I noticed this weekend that when the car is idling and the hood is up, there is a light rattle coming from the area of the supercharger. I did a quick search on the web and discovered that the CTS-V folks have been complaining of this for a while. It's the stock isolator that makes the rattling sound. Check out this link, the ZR1 and CTS-V guys have been replacing them during pulley swaps and snout porting. The CTS-V videos they show some pretty gnarly damage caused by the "spring loaded" isolator, which in turn is scattering metal shavings. During the supercharger pulley upgrade for the 2009 C6 ZR1 we include the Lingenfelter solid isolator coupling to replace the factory spring loaded isolator coupling. The factory spring loaded coupling design can sometime cause a rattle at idle or partial throttle plus we have seen some signs of wear on the shaft from the stock spring loaded isolators. This solid isolator coupling is made from a very durable high temperature plastic and is a direct replacement to the original isolator. Here is the Lingenfelter version on the left and the stock on the right. Picture of the stock one installed on dis***embly. New solid isolator going in to housing. Last edited by GenF-GTS; 16-02-2014 at 04:05 PM. This PI was superseded to update model years. Please discard PIP4523C. A supercharger noise may be experienced at idle that sounds like marbles rolling around in the supercharger. Some may also describe this as an erratic rattle-type noise that sounds similar to combustion noise on a diesel engine. This noise will only be heard at idle and it will go away when the RPM is raised off of idle slightly. Typically, the hood will have to be open to hear the noise outside of the vehicle or the vehicle will have to be parked next to a wall (ie...restaurant drive-thru, etc) to hear it from inside the p***enger compartment. When comparing this noise to other vehicles, it may be noted that other vehicles exhibit the same noise at idle but some are louder/quieter than others. This noise may be mistaken for a bad supercharger bearing, which may lead to unnecessary supercharger replacement, but it is most likely a normal noise characteristic of the torsional isolator at idle. •Park in an open area with the hood and windows closed. •With the engine at operating temperature, raise the RPM to 1200 RPM and re-evaluate the noise while sitting inside of the vehicle. If the noise is no longer present, this should be considered a normal noise characteristic of the supercharger - do not replace the supercharger in an attempt to repair this noise. If the noise is still present, allow the engine to cool, temporarily remove the supercharger belt, and listen to the noise again. 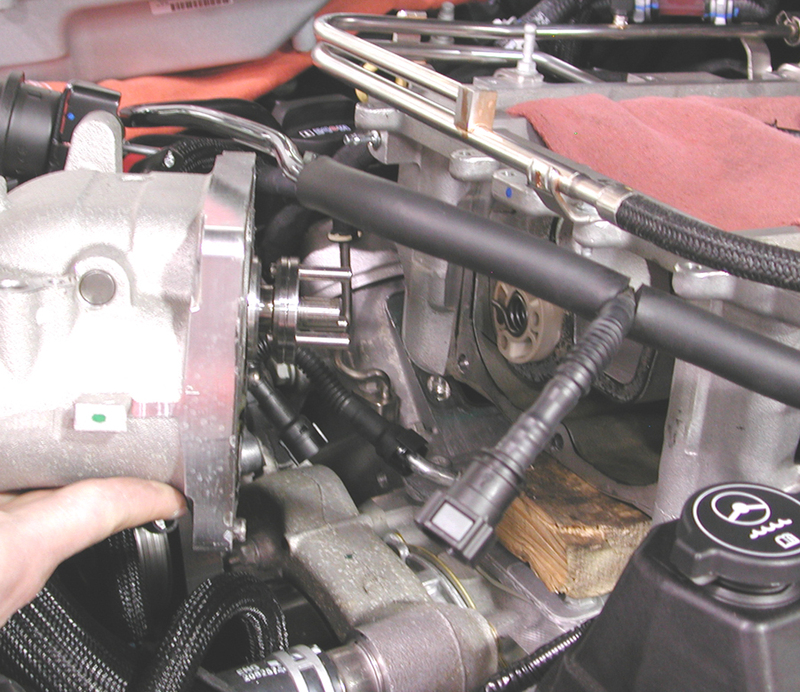 If the noise was present at 1200 RPM with the belt on but is gone with the supercharger belt removed, replace the supercharger by following SI procedures and re-evaluate the concern. Has GM ‘Shafted’ Cadillac CTS-V Owners? Like most second generation CTS-V owners, I’ve come to terms that to own the ‘fastest sedan in the world’ I have to endure a sound that can only be described as a can full of marbles, being tossed-about under the hood. Several CTS-V owners have experienced this issue which resulted in General Motors releasing a Technical Service Bulletin (TSB: PIP4523A) which basically states: the rattle is normal, take your $73,000 car and live with it. I’m Ed Piatek and I’m the Program Engineering Manager on the CTS-V. I recognize that this forum represents the thoughts and experiences of some very p***ionate owners and enthusiasts, and appropriately many of us on the engineering team periodically review this and other forums to keep our finger on the pulse of this important group. The torsional isolator is used in the CTSv LSA engine to isolate potential gear rattle noise during idle. The isolator contains a torsional spring that fits over the shaft. Purpose of the shaft is to distribute the stresses in the torsional spring. As the spring goes thru its travel, the inside of the coils can contact the shaft. The spring material is intentionally harder than the shaft which by design results in visual witness marks and/or limited wear on the shaft. The witness marks and/or limited wear is expected and has been observed on all the Eaton component durability tests, GM engine and vehicle durability tests and on customer vehicles with no impact on the functionality of the spring and isolator. The shaft and isolator are in a sealed cavity, separate from the rest of the supercharger and engine. Q: Will this shaft wear harm my engine? A: No. The visible wear will not damage the engine. The supercharger and the engine were tested and successfully validated to meet all GM durability requirements…which are much more severe than any customer usage. Q: What causes this wear? A: The isolator contains a torsional spring that fits over the shaft. The purpose of the shaft is to better distribute the stresses in the torsional spring and prolong its life. As the spring goes thru its travel, the inside of the coils can contact the shaft. The spring is a harder material than the shaft…so that when there is contact, the spring will not potentially break. If the spring breaks, then the torsional isolator function is lost. In the picture above the GM isolator is the one on the left and the community-sourced isolator (aka ‘The Fix‘) is on the right. In an effort to resolve the problem, CTS-V owners created their own fix – installing a solid isolator without the abrasive metal spring inside. And whatta ya know – silence! (or as silent as a supercharged 6.2 liter can be). This also means the shaft is no longer being disintegrated. It’s also important to note that many service managers have explained to customers that any further damage to the supercharger could not be covered under warranty, if the owner opened up the supercharger and installed a non-GM part. Like the solid isolator above. Why not install a Titanium sleeve over the shaft? Would accomplish the same fix, allow use of original spring and minimise or even eradicate wear of the shaft itself? And minimise the noise issue. The problem seems to be the shaft material is a softer metal composition to that of the spring therefore one wears down the other. I wonder if manufactured that way (in a sort of manner) to limit spring wear and failure?? Last edited by Senator01; 16-02-2014 at 05:53 PM.